We’re one month away! Are you ready? Richland County Emergency Management and the National Weather Service are partnering together to bring you storm spotter training class at the Richland Center Community Center (1050 N Orange Street) on March 14 from 6:30-8:30pm. This free training opportunity will feature training on recognizing severe weather and how to report it. This interactive multimedia presentation is given by a meteorologist, including various images and video loops from past storms in Minnesota, Iowa, and Wisconsin. Richland County typically calls upon Pine Valley Repeaters ARES/RACES members to be dispatched to specified locations due to their abilities to communicate real-time information via radio. However, you are still encouraged to attend even if you are not a trained radio operator. Contact information will be provided so any trained spotter may call in and report severe weather from their location. As a trained spotter, you would be able to watch the weather in the comfort of your home, knowing you have the knowledge on how to recognize a significant weather event, to quickly and accurately report it, to keep your family and neighbors safe. This short training is recommended for anyone who regularly spends time outside, who are responsible for the safety of a group of people, or who enjoy learning about the weather. Because of the complexity of severe thunderstorms and the potential dangers involved, spotting is recommended for adults (18 yrs or older). High school and Middle school students are welcome to attend the class with a parent or other adult. 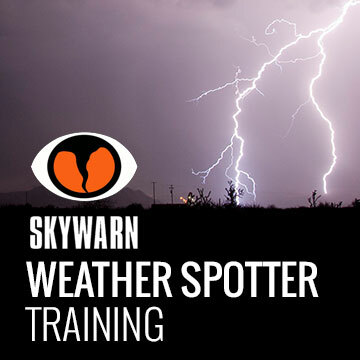 The La Crosse NWS recommends spotters attend a training session at least every other year. For more information, please visit http://www.weather.gov/arx/skywarn_schedule or call 647-8187.